The fantastic Large Santa Figure in soft muted pastel greens and ivory will enhance any festive season home decor. As a popular favorite, the Gregorian Santa combines with coordinating Gregorian collectables and serve ware for most merry table setting. 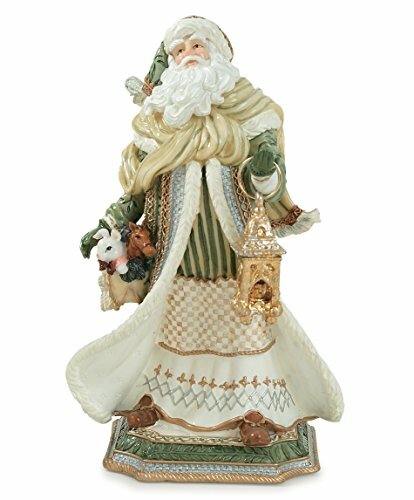 Our Gregorian Santa Claus Figurine stands 24 inches tall and wipes clean with a soft cloth. Delivered in a special box, this treasure arrives all wrapped-up and ready to offer as a guaranteed-to-delight present. For half a century, the Fitz and Floyd hallmark has become synonymous with excellence in design, quality and technique. From style-conscious homes to corporate boardrooms and royal palaces, the Fitz and Floyd look is easily recognized throughout America and much of the world. Whether it's a tea service for Her Majesty Queen Elizabeth II, Presidential dinnerware for The White House, or a holiday centerpiece for your home table, each and every Fitz and Floyd product receives the same discerning attention to meticulous craftsmanship and exquisite detail. Fitz and Floyd - often elegant, sometimes whimsical, always a prized and treasured gift. If you have any questions about this product by Fitz and Floyd, contact us by completing and submitting the form below. If you are looking for a specif part number, please include it with your message.